​Our ADULTS program consists of Aikido, Aikido Basics, and Aiki-Ken/Aiki-Jo (wooden sword and staff) classes. Our schedule provides an opportunity to practice Aikido every day of the week. We practice Aikido as taught by Morihiro Saito Shihan (1928 - 2002). Saito Shihan taught at our dojo a number of times during his tours of California in the 70s and 80s. Our classes are open to all: students of all ranks and levels train together. If there are beginners in class, they are paired with more advanced students who will guide them through basic movements. ​90 minute classes begin with about 15 minutes of stretching, warm-ups, and movement exercises, including backward and forward rolling. ​Core instruction focuses on one or more techniques. In the Iwama approach, techniques are done from a static position (ie, not moving) to start, so that students can learn how integrated body movement and extension are used to disrupt an attack and put one in position to apply a lock, pin, or throw. The instructor will help students individually as necessary. ​Slow and guided practice for beginners and advanced students. In our Basics classes, instructors cover foundational skills such as falling, footwork and moving in response to our partner (what we call 'blending'). Importance is placed on proper alignment and posture and safety for each partner. Fundamental concepts and principles are investigated and discussed while the class works on basic (i.e. not complicated) techniques one step at a time, with minimum use of power. Falling is guided and paced. The pace of practice ensures safety for beginning students and allows continuing students to strengthen their grasp of fundamentals while they further deepen their practice. Saito Sensei focused on basics and wanted everyone to learn and feel accomplished in their practice, especially as beginners. In that spirit, we aim to preserve and maintain the same strong focus on aikido basics. One of the ways we do that is through our Basics classes. The Basics classes are a good place for new and advanced students to work on basic skills that serve as the foundation on which to build further study. As we get deeper in practice, we learn that basics are in fact at the heart of it all. ​Wooden sword and staff practices for Aikido. Open to students of all ranks and levels of experience. ​*At the instructor's discretion, Aiki-Ken and Aiko-Jo practices may also be included during other classes on the schedule. The Founder taught wooden sword (bokken) and wooden staff (jo) practices at the Iwama dojo. Saito Sensei augmented these practices with suburi and kata that have became part of our curriculum. 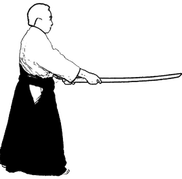 The main philosophy behind practicing with weapons in aikido is that the movements with a blade in hand teach us how to move without the blade. Weapon techniques are included in tests from the very beginning of a student's progression through the ranks. Open to all, but students should be able to do forward/back rolls. While the Iwama Aikido approach is to break things down and move from static positions, another approach commonly known in the Aikido world is to start with movement in the attack and keep that movement going throughout the whole technique. This means a lot of going down and getting back up.. The ki-no-nagare class on Saturday mornings is focused on movement and therefore being able to take falls and get up quickly is a requirement. The class places emphasis on cardio; a different kind of warm-up is done in the first 15 minutes, consisting of jogging and various strengthening exercises. Need to make a dojo payment?